My Marbling Students are the Best! I've blogged before about people who have taken my marbling classes who have either incorporated their marbled pieces from class into their own work (like elle's marbled mandala) or who fall in love with marbling and take it to a whole new level (like Steve's marbled bark). Well, it was such a joy to get yet another email from a student showing me what she did with her latest round of marbled papers. Mel has taken both my Experience the Tank and Beyond the Tank classes...and I must say, she is the best gel-gitter there is on the planet. They always come out perfect. And to watch her do one puts you in a trance ~ she's very calm and zen about it! Mel uses her marbled papers to make her own note cards and below are two examples she sent me. 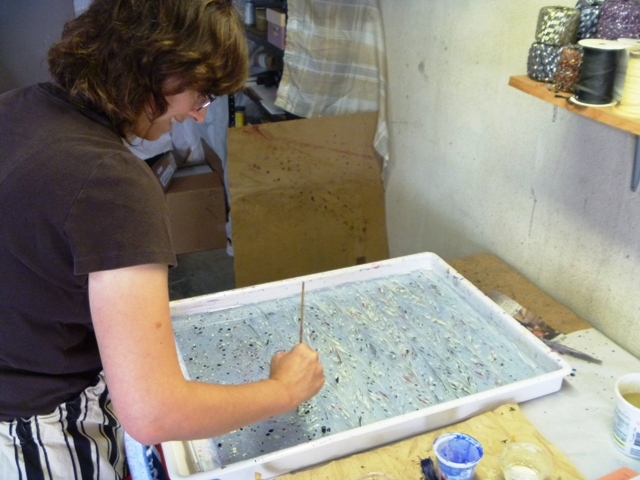 The background is made from the marbled paper she is designing in the photo above (which, of course, is a gel-git)! And the leaves are cut from another marbled paper she made in that session. I cannot say enough about how enjoyable I find the people who take my marbling classes. Marbling clearly attracts a certain "element" ~ those who are adventuresome, who enjoy a little mystery and magic, who see the beauty in air bubbles and can laugh at spilled paint, and who, above all, feel compelled to create and learn and share...and have fun while doing so. At least that's the type of people I've been fortunate to have in my studio this past year. I hope 2013 brings me the same!